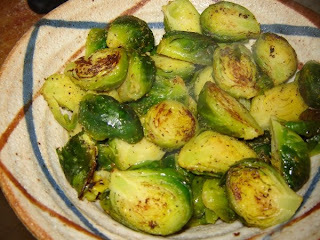 In case you're trying to think of an awesome and delicious, (and easy) green side-veggie to have on your Non-Turkey Day table - try roasted Brussels sprouts!! Even confirmed baby-cabbage haters *cough*mychildren*cough* just might be convinced by the enticing lemon-garlic aroma of these wonderful little things! Clean, trim and halve the Brussels sprouts. Toss with the olive oil and roast in a 400 degree oven for 10 - 15 minutes until sprouts JUST start to brown and caramelize - this may take more or less time, depending on oven/pan/size of sprouts, etc... Turn once or twice. Remove from oven and add garlic, nuts and salt. Roast for another five minutes until nuts and garlic start to lightly roast, but NOT turn dark! Garlic and nuts are bitter if they get too dark. Remove from oven, squeeze about 1 - 2 teaspoons lemon juice over sprouts, sprinkle with fresh grated lemon zest. If you like more garlic "kick", add another crushed clove, raw, after sprouts are done. I want to swim in this bowl. Wow, that looks awesome. I may even try it and I hate brussel sprouts. I love Brussels Sprouts SO much, this sounds perfect! MMMmmm... Those brussel sprouts look awesome! I love brussel sprouts prepared anyway, but this way looks awesome! I've been seeing roasted brussels everywhere lately! I've never thought to do them with citrus though - just the other day I saw lime roasted brussels. Sounds so good, in a weird way. Yum! Those look awesome. I love Brussels sprouts. I think this dish will be gracing my holiday table this year. I adore Brussel sprouts and think they are little packets of heaven. I even liked them when I was a kid!